Decks are being cleared for negotiations to begin between the Union Government and the Khango-led NSCN (K) group under the initiative of the Nagaland GB Federation (NGBF). In a statement issued on Wednesday, NGBF media cell disclosed that the federation, during its meeting with the Khango-led group at Yankhao village on October 25, was officially endorsed to pursue the issue with the Centre in order pave the way for the group to enter into ceasefire at the earliest. 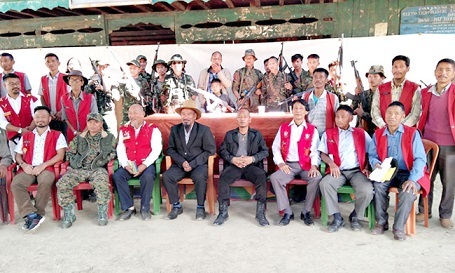 At the meeting, NGBF said Khango acknowledged the appeal of the Nagas and decided to resume ceasefire with the Centre. NGBF said Khango-led NSCN (K) also placed a four-point demand to the Central Government for consideration. These include lifting of ban imposed on NSCN and removal of terrorist tag; rescind the bounties placed on NSCN leaders; repeal AFSPA/DDA on the enforced Naga areas and unconditional release of NSCN cadres arrested after the abrogation of ceasefire and undergoing trials or serving sentences in different prisons across the state/country. Subsequently, NGBF said the federation met with interlocutor for Naga talks, R N Ravi on November 1 last in New Delhi. The statement also mentioned that the Central Government has no objection for NSCN (K) to maintain their entity. It stated that as soon as the outfit comes into peace process dialogue with the Centre, ban on NSCN (K), terrorist tag and bounties on its leaders will be automatically removed.